Children learn most readily in an environment where they can experiment, enjoy and discover things for themselves. This intentional way of learning is exactly the kind of environment we’ve created at Guardian Early Learning Centre Caringbah. Our experienced educators support learning and development by creating spaces that allow children to view the world differently; inventing, creating and imagining a whole new world of possibilities. Our bright and inspiring custom-designed spaces and structures waiting to be explored. Each of the wonderful rooms is setup to include designated areas for loose parts as well as opened ended play resources. The continually growing loose parts collection is made up of old wooden spools, corks, cardboard boxes, tubes, barrels, baubles and more. These tinker’s treasures provide children with the opportunity to follow their innate creativity. We love watching these trinkets become rescued and re-imagined as juggling items for a circus, currency in a shop or other magical manifestations as they learn to look beyond the ordinary. At Caringbah, we focus on open ended and loose parts resources as they not only create endless opportunities for imagination but can also be adapted and manipulated, encouraging the development of fine motor skills. As the children twist, turn and pull items such as old rope spools and attempt to fit larger items inside smaller ones, they’re developing an understanding of how things work. Our team of qualified and experienced educators are big believers in ‘messy play,’ which is why our sand and mud pits are always available for the children to experience the joy of getting grubby. Experiencing sensory stimulation from running their hands through mud or jumping in puddles with abandon is priceless. This allows them to connect physically, learning through touch, smell and the occasional taste. We have also created a wonderful outdoor learning space dedicated to our preschoolers. On this beautiful rooftop garden, our team supports the older children in maintaining their very own place to explore and discover within their own territory. This freedom aids in developing self-help skills and a sense of responsibility. At Guardian Early Learning Caringbah, we promote self-decision, self-exploration and a respect for learning that children can carry through life. 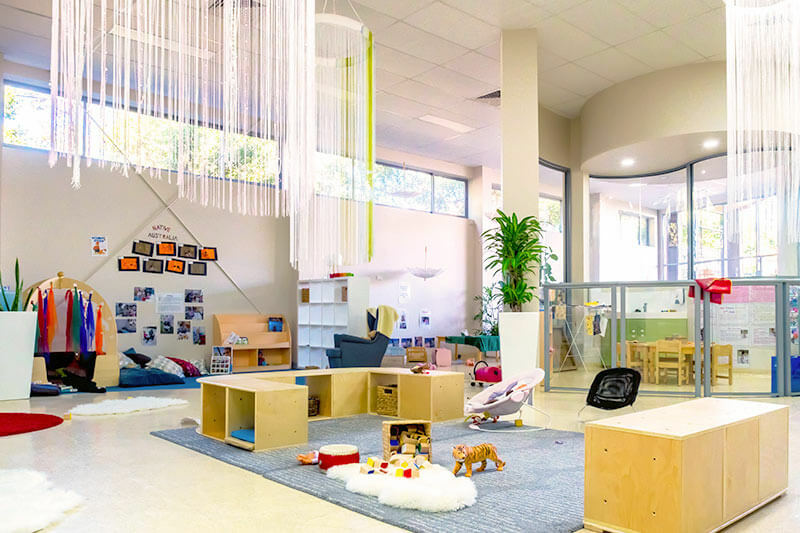 Our centre strongly aligns with the Reggio Emilia approach to early learning and development which means our educators have access to a wealth of knowledge, allowing them to grow within this ever-changing profession. We are proud to have one university-trained teacher in each of our spaces. In addition, we have a degree-qualified director as well as a fully-qualified chef providing delicious, nutritionally-balanced meals. We have four early childhood qualified professionals available to the children each day, with half of our team having between eight to 10 years’ experience supporting newer educators with up to three years’ experience. Guardian Early Learning Centre Caringbah has an ‘Exceeds National Quality Standard’ rating that we uphold at all times. We’re very proud of the hard work, high standards and commitment that our Guardian family put in on a daily basis as we constantly strive to better ourselves and our practices. Our beautiful centre is dedicated to the care of our future generations. Equipped with a large range of resources as well as indoor and outdoor spaces, our educators promote a sense of wonder and curiosity that leads to a lifelong love of learning.